Businesses have taken notice of the mobile Wi-Fi hotspots trend and have invested in mobile hotspot devices. Question is, which of several options is most suitable for business? in the mobile Wi-Fi hotspot space is expected to reach tens of billions of dollars over the next few years. While much of this uptake will be consumer driven, businesses will increasingly use mobile Wi-Fi hotspots to better enable their mobile workers and make better use of their bandwidth subscriptions. Why do businesses need mobile Wi-Fi hotspots? An ordinary Wi-Fi hotspot covers a fixed area—a hotel lobby, a café, a business center —providing free or paid Internet access to users with Wi-Fi enabled computers and phones. But finding these hotspots can be difficult, and they make users somewhat stationary. After all, workers using iPads in a coffee shop can't stay connected after they finish their latte and jump into a cab. To accomplish the latter, many mobile hotspot devices have their own mobile broadband (3G or 4G) subscriptions. For example, the iPad can come equipped with 3G and Wi-Fi, but 3G service adds $15 to$25/month, depending on usage. Alternatively, an external or built-in USB 3G adapter can connect laptops or netbooks, but that too requires a 3G plan. If employees carry both devices, companies can end up paying for 3G twice and even three times if you add a 3G phone to the mix. Mobile Wi-Fi hotspots combine the best of both worlds, letting several Wi-Fi clients share the same Internet connection, supported by a single mobile broadband device. Most mobile hotspots support three to five Wi-Fi connections, perfect for workers with multiple devices that need Internet access. Mobile Wi-Fi hotspots can also be used by colleagues or families to collaborate while sharing Internet access, being subject to bandwidth limits associated with a single 3G/4G account. The Novatel MiFi (see below) may have been the first widely successful personal mobile hotspot, but the MiFi and similar devices from Sierra Wireless (Overdrive) and Cradlepoint (PHS300) are not the only games in town. These hardware mobile hotspots are facing competition from software, especially on smartphones. Dedicated hardware mobile hotspot devices are designed to be pocket-sized and operate for a decent period—perhaps 4 active hours on a single charge—while delivering fuss-free Internet connectivity for several Wi-Fi clients. With one push of a button, the hotspot is ready for use. Stop using it awhile and the unit falls asleep, conserving the battery. 3G/4G plans vary, but carriers offer day passes, prepaid MB allocations or monthly fees without a contract. Smartphone mobile Wi-Fi hotspots are applications that run on dual-mode (3G+Wi-Fi) phones like the Samsung Galaxy (see below). When the application is running, the phone's Wi-Fi connection changes from client mode to "softAP" mode, routing traffic from several Wi-Fi clients onto the phone's mobile broadband connection. During hotspot use, the phone cannot connect to home or enterprise wireless LANs, and it may or may not be able to take 3G voice calls. Yet after the hotspot app is stopped, the smartphone returns to its usual functioning. Although some smartphone hotspots are included with 3G or 4G subscriptions, most carriers charge an extra $10 to $20 per month to enable this option. A dedicated mobile hotspot device won't drain a smartphone's battery or interfere with the ability to use the Internet and take voice calls simultaneously. Some dedicated mobile hotspot devices provide SD storage and run a small selection of apps. For example, the AT&T MiFi 2372 ($49.99 after $100 rebate) runs GPS-enabled GeoSearch and GeoWeather widgets and other apps written for the MiFi OS. However, dedicated mobile hotspot devices are not really general-purpose computing devices—they are optimized to connect Wi-Fi clients to the Internet. 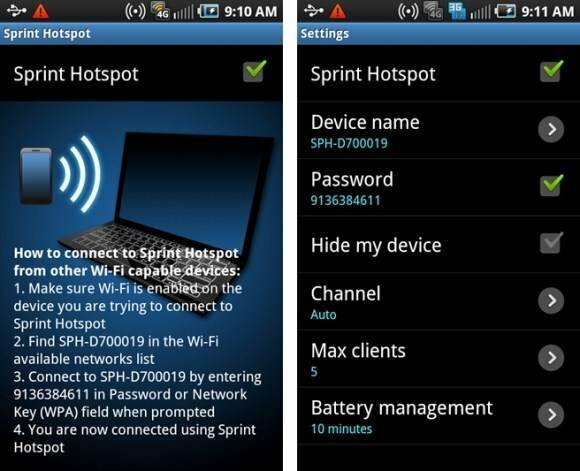 A smartphone mobile hotspot allows a user to "double up" on a phone's 3G data plan. There’s no need to remember to carry—or charge—another device. If the goal is to utilize one device, a smartphone is far more versatile, as it can run tens of thousands of apps. However, paying an incremental fee to use this feature is almost always a stipulation, and hotspot usage contributes to any bandwidth cap imposed by a 3G/4G plan. 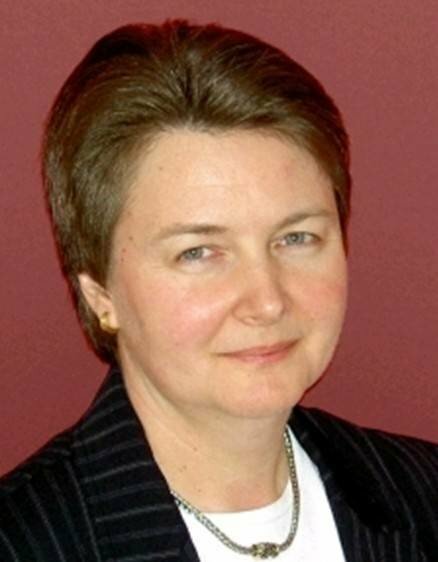 It can also be hard to track monthly bandwidth consumption in near-real-time to avoid overage fees. 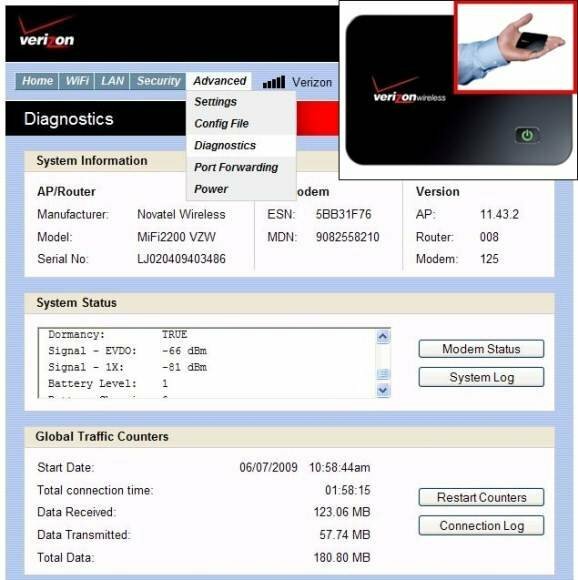 The Wi-Fi adapter will now be associated with a virtual AP. 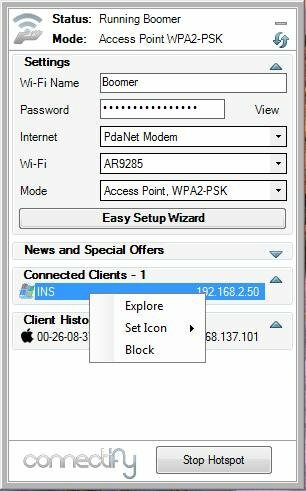 To turn that virtual AP into a personal mobile hotspot, one more step is required: configuring a 3G/4G mobile broadband adapter or modem to share Internet access with the virtual AP (see below). As long as the 3G/4G connection and virtual AP are both enabled, other Wi-Fi clients can connect and reach the Internet through the Windows 7 netbook. This option is far less turnkey or mobile. Commands must be entered every time there is a request to enable the mobile hotspot, and even a small netbook with an internal 3G/4G adapter is bulkier. However, there are no fees required to enable a Windows 7 virtual adapter, and no limit on the number of Wi-Fi clients that can connect simultaneously. The netbook can still be used for other computing tasks while being used as a mobile hotspot. With an existing Windows 7 netbook with built-in 3G, this approach can create a mobile hotspot without purchasing an additional device or subscription. 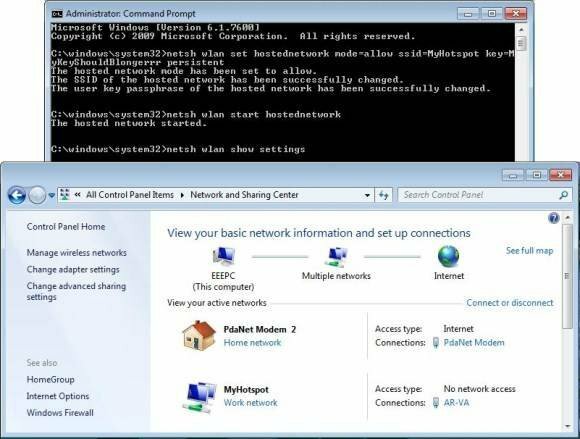 Users interested in turning a Windows 7 netbook into a mobile hotspot may want to streamline configuration and start/stop by installing a program like Connectify. This inexpensive software builds upon native Windows 7 virtual APs by adding a user-friendly hotspot setup wizard and a control/monitoring GUI that resides in the netbook's system tray for easy access (see below). Another option is Wi-Fi Direct. This new Wi-Fi Alliance specification lets Wi-Fi devices communicate directly instead of requiring a Wi-Fi AP. A single device in a Wi-Fi Direct group network can share Internet connectivity with other Wi-Fi Direct devices by establishing two concurrent network connections—one to the group and another to the Internet. Wi-Fi Direct-certified products are just now emerging, so it's too early to determine much more about this option. Yet this could end up being a good way to connect non-traditional Wi-Fi clients, such as cameras and handheld games that use Wi-Fi Direct, to discover nearby group members without requiring setup. For a business to find the best solution, it is important to consider how often each worker needs a mobile hotspot, where and how long he or she will use it, the number and type of Wi-Fi-enabled devices being carried and whether any of those devices already have a 3G/4G subscription. Infrequent or occasional mobile hotspot users should consider a pay-as-you-go hardware mobile hotspot, or a roll-your-own solution to avoid monthly fees. Those who expect to use mobile Wi-Fi hotspots frequently for short periods of time should go with a commercial solution to maximize productivity. To connect several clients simultaneously for long periods of time—30 to60 minutes at a stretch—it is important to consider a hardware mobile hotspot to avoid smartphone battery drain or blowing away bandwidth caps. To use a mobile hotspot often to connect just one other client (like a Wi-Fi only tablet), the convenience of a smartphone hotspot is undeniable. Those who already have one 3G/4G plan may prefer to start with a mobile hotspot that reuses that subscription. This allows a business to determine the frequency of use of a mobile hotspot with minimal investment, while learning more about characteristics to look for in a more permanent solution. Beyond these general recommendations, there is no one-size-fits-all mobile hotspot. Usage patterns and personal preference can make all the difference between a mobile hotspot that gathers dust, and one that is truly indispensable. Employers may want to offer users more than one approved option—carefully selected to reduce total spending on mobile broadband, while keeping workers well-connected and productive.